And last year, we went to the see the hilarious and powerful The House That Will Not Stand, at the Tricycle Theatre in Kilburn. The play was focused on the past New Orleans tradition of placage, where wealthy white men entered into “common law” marriages with free women of colour. It was fascinating and incorporated old slave rituals, Creole language and New Orleans culture. It also reminded us that we had bought a travel guide to New Orleans a couple of years ago and we really needed to put it to good use! If you like food (and if you should, if you’re on this page! ), you will love New Orleans. From the po’ boys to the gumbo to the jambalaya to pralines to beignets, there’s a lot of good eating. New Orleans cuisine is definitely soul food and not diet food. We had to come to terms with the fact that we would really just have to let go and enjoy every bite! Now that we’ve come back to cold and rainy London, we’re really missing New Orleans. So the first thing we did was try to come up with our version of rice and beans, adapted from Emeril Lagasse’s recipe. Apparently it was Louis Armstrong’s favourite dish and we loved it. 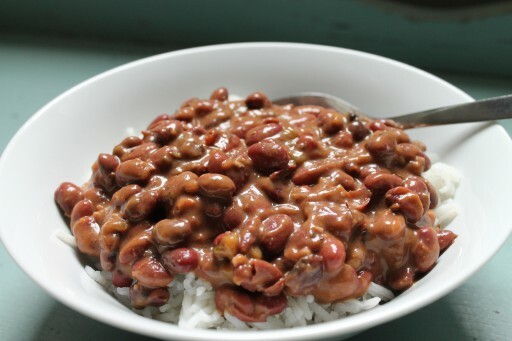 It really reminded us of Indian red kidney bean curry (rajma) though it is cooked very differently, usually with a ham hock. We could only find pork osso buco in our local supermarket (very posh) so we used that instead. It wasn’t totally authentic but it turned out to be a wonderfully comforting dish and perfect to cook in bulk to eat throughout the week. Saute the osso buco, bell peppers, celery, salt, cumin and bay leaves for about 5 minutes. Add the beans, garlic, stock cube, jalapeno (and juice), parsley, chicken, Creole seasoning and enough water to cover the contents in the pot. Bring to a boil, reduce the heat and simmer uncovered, stirring occasionally. Add more water if the mixture becomes too thick. If you’d like the mixture to be thicker, you can use a wooden spoon to mash some of the mixture against the side of the pot. Remove the osso buco from the pot when the meat is tender and/or falling off the bone. Cook for about 1 1/2 hours, or until the mixture is creamy and the beans are soft. Add more water if it becomes too thick and stir occasionally so that it doesn’t stick to the bottom of the pan. 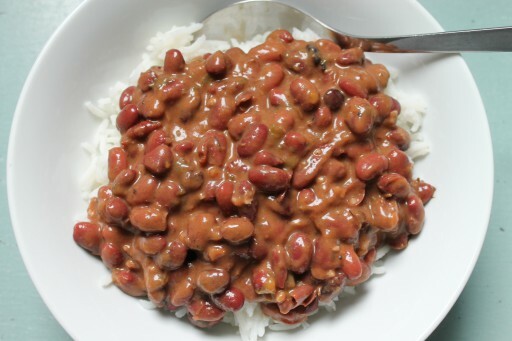 Remove the bay leaves and chicken bone from the beans, adjust the salt if necessary and enjoy with cooked white rice.